Guiyang Symphony Orchestra has been so honored to appoint Mr. Rico Saccani to be the new music director. On the basis of a cooperation agreement by both parties, Rico Saccani will assume responsibility as music director in Guiyang Symphony Orchestra in September 2016. 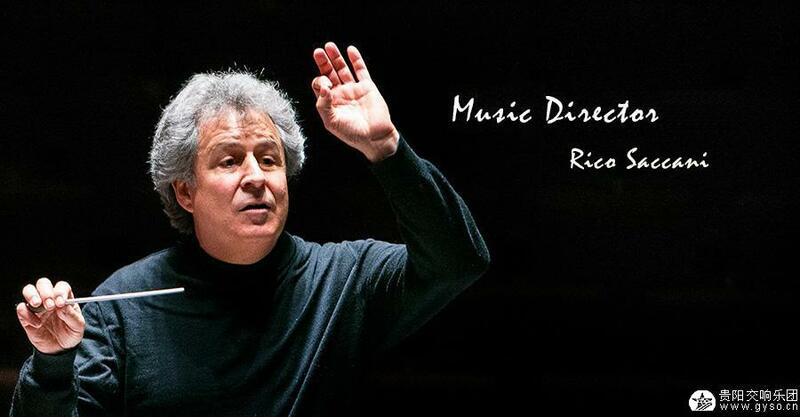 To be one of the world famous remarkable conductors, we believe in Mr. Rico Saccani and expect his coming! He has returned on numerous occasions as a guest conductor with the most important symphony orchestras around the globe, such as Bavarian Radio Orchestra、Czech Philharmonic Orchestra、Cologne Gurzenisch Symphony and Opera Orchestras、Houston Symphony、Oslo Philharmonic、Royal Philharmonic of Denmark、Tokyo Philharmonic、Yomiuri Symphony Orchestra. He has also worked with many of the world’s greatest solo artists, such as Alicia De Larrocha, Stephen Isserlis, Denis Matsouev, Sabine Meyer, Kun Woo Paik, Dimitri Sitkovetsky, Maxim Vengerov, Julian Lloyd-Weber, Pinchas Zuckerman, etc, as well renowned Beaux Arts Trio. Maestro Saccani has also appeared at the Hamburg State Opera, the Lyon Opera, the Monte-carlo Opera, the Arena de Nimes Festival, the Paris Opera Comique, Rome, Dresden and Cologne Operas. He made his Metropolitan Opera debut in Il Trovatore and re-engaged for the first international radio broadcast of Traviata and Aida. He was also invited to conduct at the Teatro San Carlo (Naples), the Arena di Verona (Rigoletto), the Houston Grand Opera, the Puccini Festival Torre del Lago (Turandot), the Teatro Bellini di Catania (La Favorita and I Puritani) as well as the Maggio Musicale Fiorentino, the Avenches Swiss Festival and the Santander Summer Music Festival in Spain. Maestro Saccani initiated a “Verdi Marathon” in the Hungarian State Opera house in January 2000 celebrating the Millennium where he conducted seven Verdi operas in 9 evenings. He returned to New York’s Carnegie Hall and Washington’s Kennedy Center that same year with the Iceland Symphony as their Music Director on their acclaimed North American tour. He conduct the great singers such as Roberto Alagna, Cecilia Bartoli, Piero Cappucilli, Iliana Cotrubas, Alfredo Kraus, Edita Gruberova, Thomas Hampson, Leo Nucci, Luciano Pavarotti, among many others.